When it comes to home-court advantages, basketball players benefit from sleeping in their own beds. Or so goes the theory. 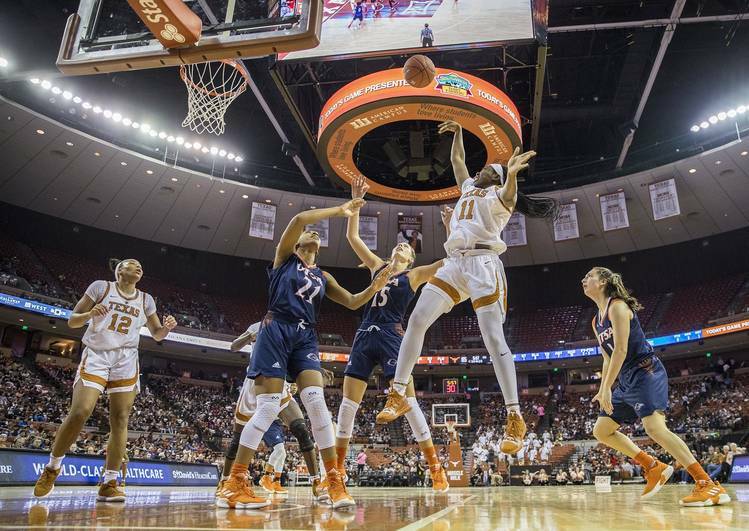 Such does not appear to be the case for the 15th-ranked Texas women’s basketball team, which has done just fine while staying at unfamiliar hotels far from home. A respectable 19-5 overall, the Longhorns have played surprisingly well on the road, posting a 10-1 mark in games away from the Erwin Center. As Texas prepares for the final six games of the regular season, the Horns are coming off two of their best games of the year — a 76-67 victory at Oklahoma on Feb. 2 and a 91-73 victory at Kansas on Saturday. Texas is 7-1 in true road games and went 3-0 in an invitational tournament in Florida in November. Despite losing Lashann Higgs, UT’s top shooting guard, to a season-ending knee injury in the season opener, the Longhorns responded by beating Quinnipiac 56-55, Michigan 69-52 and Fordham 72-54. By comparison, here are UT’s road records the past five seasons: 8-3, 9-3, 10-2, 4-7 and 4-8. The Longhorns are under a tight schedule when they are on the road. Cell phones are confiscated the night before a game. Lights are out at 11 p.m.
Before most road games, the players wake up about 8:30 a.m. and have a shoot-around for an hour. They eat lunch, have a one-hour study hall and a few hours to do whatever they want. If a game is at 7 p.m., the pregame meal will arrive about 3:30. Buses leave for the arena at 5:30. Cell phones are returned to the players in the morning but then taken back before the pregame meal. When the Longhorns win a road game, cookies are provided on the flight back to Austin. The only road setback has been an 87-69 loss at Kansas State on Jan. 16. Beginning with Tuesday night’s game at Oklahoma State, Texas has three remaining road games on its Big 12 schedule. The others are Feb. 25 against Baylor and March 5 against TCU. The best part of Saturday’s road victory at Kansas was the return of freshman guard Audrey Warren, who missed three games after sustaining a nasal fracture at Texas Tech on Jan. 26. She will continue to wear a protective mask to guard her nose until it is completely healed. Is Texas still an option for 4-star CB Marcus Banks after his decommitment from LSU?